Coldwaltham is a parish of the three communities; Coldwaltham, Hardham and Watersfield. Three hamlets, connected by 3 miles of the A29, just south of Pulborough, and totalling about 420 households. Situated just north of the chalk South Downs, adjoining the River Arun towards the top end of it’s tidal reach and with the celebrated Wild Brooks wetlands, home to and stopping off point for large numbers of wild birds and other fauna, we are indeed in a privileged natural setting. In 2012 our parish became part of the South Downs National Park, helping to retain our appeal as a small country community in this beautiful part of England. Access to the parish easy by road – we’re on the A29 running North – South which joins with the A272 to the north and A27 at Arundel to the south, with rail connections at Pulborough, Amberley and Arundel. 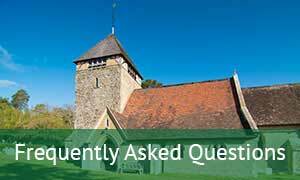 We have two churches – at Coldwaltham and Hardham (which is world famous for it’s murals), St. James’ C of E Primary School, Sandham Hall for local events and community use, Alban Head Playing Fields, Lodge Hill activity Centre, the Youth Club for youngsters and our local public house. The Labouring Man Public house is a thriving village meeting point and there is also an internationally renowned music and art centre at Champs Hill. The South Downs National Park Authority has produced a final draft of the South Downs Local Plan. This is now open to public consultation under Regulation 19 of the Town and Country Planning (Local Planning) (England) Regulations 2012. The consultation will run from 26 September 2017 until 21 November 2017. All documents relevant to this consultation are available during the consultation at the following website address: http://www.southdowns.gov.uk/localplan . Select file “Chapter 8-Chapter 9”, details of the Coldwaltham site are located on pages 42-44 (of 155). Storrington Library main counter, Ryecroft Lane, Storrington, RH20 4PA (Mon-Fri 09:30-17:30; Sat 10:00-16:00). South Downs Centre reception, North Street, Midhurst GU29 9DH (principal office) (Mon-Thu 09:00-17:00; Fri 09:00-16:30). The South Downs National Park Authority are encouraging residents to respond to this consultation using their online consultation tool. This allows comments to be made to specific parts of the Local Plan and accompanying documents, without the need to complete paper forms. Please go to http://www.southdowns.gov.uk/localplan to access the online consultation. 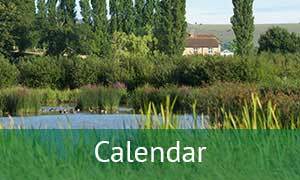 Alternatively, you can respond my email or by post – see the SDNPA website for further details. 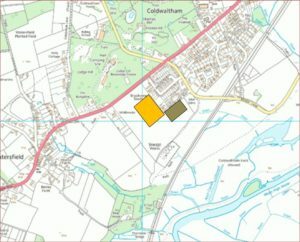 At its meeting on 15 June, the Planning Committee of the South Downs National Park Authority considered the above map of its proposed allocation of land for housing in Coldwaltham. 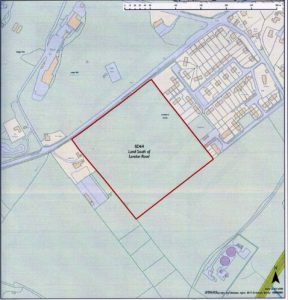 The map differs from information provided in March, when the area for development was to be set 25 metres back from the A29, and a 70 metre-wide gap was to be left between the development and the adjoining property known as Wildbrooks. It was this information that was represented on the map produced by the Parish Council and previously shown on this website (see below). This new map raised questions which we have sought to clarify with the Authority. The area outlined in red was 3.8 hectares, but the June proposal was said to cover 8.1 hectares. There was a proposal for publicly accessible open space, but it was not clear whether that was to be included in the 3.8 hectare square, or would be additional to it. The Authority have now said that the full 8.1 hectares of the meadow would be acquired, but that only the area outlined in red would be built on. The number of houses would remain at 35 to 40, plus a possible shop. The public open space, and an associated car park, would occupy the remainder of the meadow. This is the enclosure shown to the north of the sewage works and south of Brookland Way. The red area proposed for development in June, at 3.8 hectares, is nearly twice the area proposed in March (2.1 hectares) and previously shown here (April 2017). Yet the number of houses has not changed. Other things being equal that would imply a relatively low housing density, but no further detail has been made available at this time. 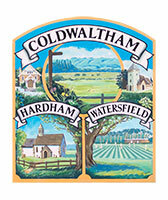 Coldwatham Parish Council are due to start their discussions regarding SDNPA proposed allocation at their council meeting on 13th June. The Parish Council is seeking resident’s thoughts to enable them to reach an informed response, before the public consultation to be held in the autumn. In March 2017 the South Downs National Park Authority put forward a completely new proposal for future housing in the Parish, in the latest draft of its Local Plan for the Park as a whole. In September 2015 it had replaced earlier land allocations made by Horsham District Council with a proposal for some 20 houses on a site adjoining Brookland Way (shown in brown on the map). The Parish Council has now been told (April 2017) that this site too has been dropped in favour of a new site, twice the size, at the other end of the same field (shown in orange). The number of houses has also been doubled to 40. The Parish Council met with the Planning Officer responsible for land allocations in the Park on 10 April to clarify the reasons for this proposal, and how it was thought to serve the goals of the National Park. He said that on reviewing the allocations he had concluded that the Brookland Way site was too constrained. 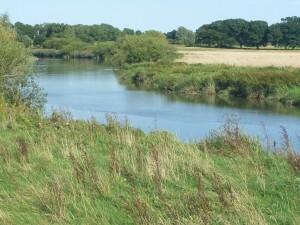 What’s more, Natural England (a Government conservation body) and the Sussex Wildlife Trust had objected that it was too close to protected areas of the Brooks. The site previously designated by Horsham on the other side of Brook Lane along the railway was no better in these respects. He accepted that the new site would block the view of the Downs from the A29, but believed that it would permit a more imaginative development, with new publicly accessible open space. The Parish Council wanted to know why such a significant proposal had surfaced at such a late stage in the long-running development of the Local Plan, when two rounds of consultation had already been concluded. The need for some new housing was understood, and the Council had not objected to the more limited Brookland Way site. 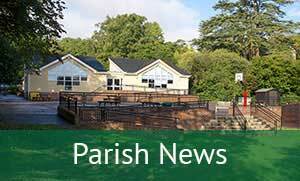 But how could the views of the Parish now be taken into account? We were assured that there would be a further 6 to 8 week round of consultation in September, before the Park Authority put its final proposals to the Secretary of State. In the meantime, the Parish Council will be seeking local reactions to shape the community’s response to this new scheme. Number of houses Should it stay at 20, as previously proposed, or should 40 – a 10% rise in parish households over say 10 years – be manageable? Employment What local jobs might be available for new arrivals? Or would they more likely commute to major centres, and what with what effects? 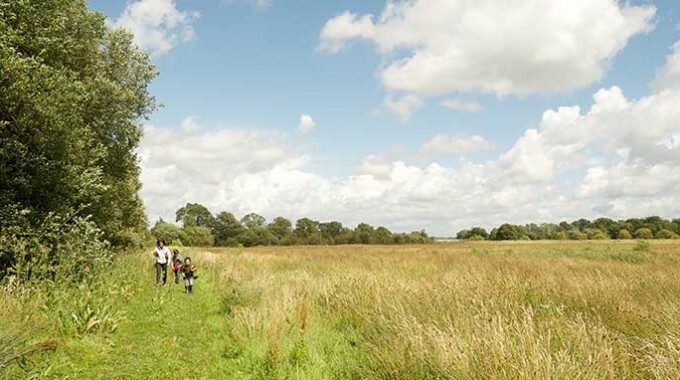 Location Is the proposed site compatible with the special qualities* of the National Park? What other site or sites might be more suitable? Infilling Would the proposed development tend towards joining up Coldwaltham and Watersfield, and what effects might that have? Type Should the houses be mainly ‘affordable’, as for example the new Silverdale development, or mainly market housing? School St James needs to increase the school roll to secure its future, so should more ‘family’ houses be welcomed? Open space What should be the purpose of the proposed accessible open space? Playground, playing-field, meadow, amenity land? Traffic How manageable is likely traffic from the development, including its interaction with the A29? * The South Downs National Park Authority has identified Seven Special Qualities that the National Park exists to promote. In abbreviated form, these are: inspirational landscapes and breath-taking views; a rich variety of wildlife and habitats; tranquil and unspoilt places; an environment shaped by farming and embracing new enterprise; opportunities for recreation and learning experiences; historical features and a rich cultural heritage; distinctive towns and villages with pride in their areas. Did you know that Coldwaltham Parish is largely bounded by rivers? 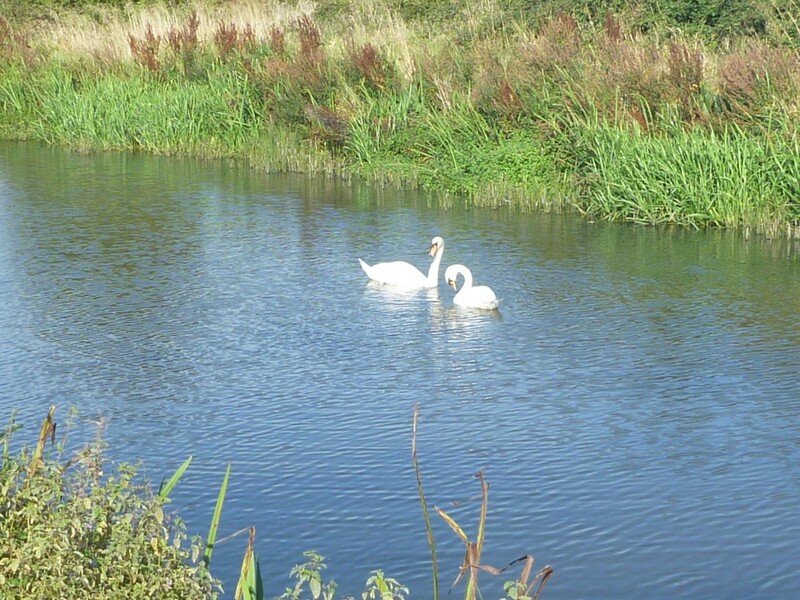 Over three quarters of our 11 mile boundary is set by the Rivers Arun and Rother. Our only ‘land frontier’ is at the western end of the parish. The loop towards Coldwaltham, just north of Greatham Bridge, is no exception as it marks an old meander of the Arun. Yet access to our extensive river frontage is surprisingly limited. 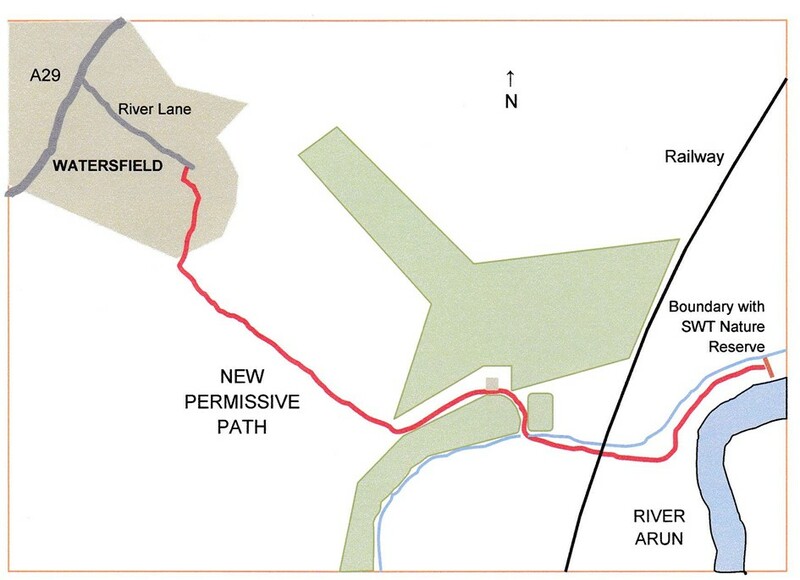 To improve this state of affairs the Parish Council and the Barlavington Estate have agreed a permissive path for parishioners to use, as shown in red on the sketch plan below. One kilometre in length, it runs from River Lane, Watersfield. through the wooded area shown in green (where nightingales can be heard in May), and then by way of Thorndale railway bridge to the River Arun. The path extends to the edge of the Sussex Wildlife Trust nature reserve of Waltham Brooks, public access land where parishioners also have historic fishing rights. From there one may continue as far as Greatham Bridge, returning to Watersfield on the public right of way across the Brooks. The new path is not a formal right of way and will be closed for one day a year, 1 February, but the landowner does not otherwise intend to restrict access. A glimpse of the scenic landscape which can now be reached is given in these photos. Enjoy, always remembering that these are the ‘Wild Brooks’, with a seriously deep and fast-flowing tidal river, plus other water-filled channels, prone to flooding especially in winter and with unstable banks and marshland areas. Take care! 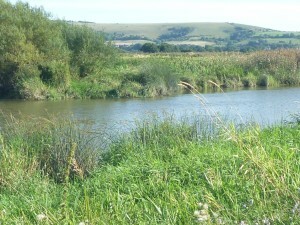 Downstream across the Arun to the South Downs.